It was great to take part in the educational programme Irish, 'Alive and Mostly Female', which is bringing artists from the Louth County Council Art Collection, into the classroom, to talk about their art practice and the art piece in the Louth Art Collection School. 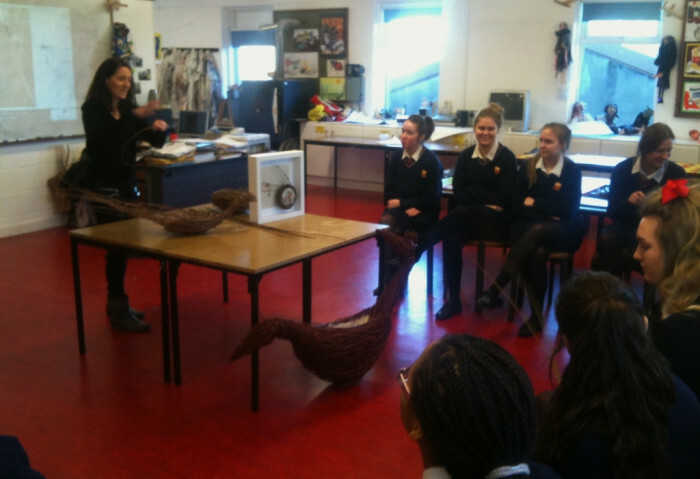 I was delighted to be choosen to do a presentation about my artwork to the 5th year students of Sharon Staffords Art Class, at Sacred Heart Secondary, Drogheda. Today was the second of our Artist Visits as part of this 10 week programme. Breda Marron gave a very comprehensive presentation on her work – she talked about her use of materials – primarily wicker and described how it is grown, different varieties of colours and thicknesses. She showed examples of her artistic influences including Andy Goldsworthy (http://www.goldsworthy.cc.gla.ac.uk/) and Patrick Dogherty(http://www.stickwork.net/) – both artists who work in natural materials and site large and small scale work in nature. Breda works between 2D drawing and painting and 3D sculpture – the forms and the physical process of building up the forms/ shapes and materials are similar. Her materials include wicker, bronze and concrete. Her creative process responds to the materialiality and tactile qualities of her chosen materials. Her themes are based on natural forms – birds, nests, nature and a meditative spiritual energy. Through images on screen Breda talked us through a range of works and projects from the large scale art commission The Giant’s Lair, Slieve Gullion Forest Park where she worked in concrete and wicker to large scale free standing works like Angel at Sculpture in Context, National Botanic Gardens. She also talked about the physical and technical challenges in making large scale work outdoors and the need to consult with engineers, metal workers, and the bronze foundry to construct her work. And also the unexpected elements to her work as with her large scale suspended Phoenix Nest installed in Highlanes Gallery in Drogheda which emitted the fresh smell of nature throughout the gallery!